the media hype about the Samba is still big. Next Tuesday a film team flies over to Bonn to make a report about the project. The Samba is currently in the exhibition hall of a big Bonn VW-dealership, the ARG-company in Bonn-Bad Godesberg. They are kind enough to make a little event next Tuesday (July 3rd) morning from 9.00 am on. All owners of vintage Volkswagen are invited to join the party, so come over, the weather forecast is fine! You will see the Samba driving as the film crew wants the bus to drive around the yard. 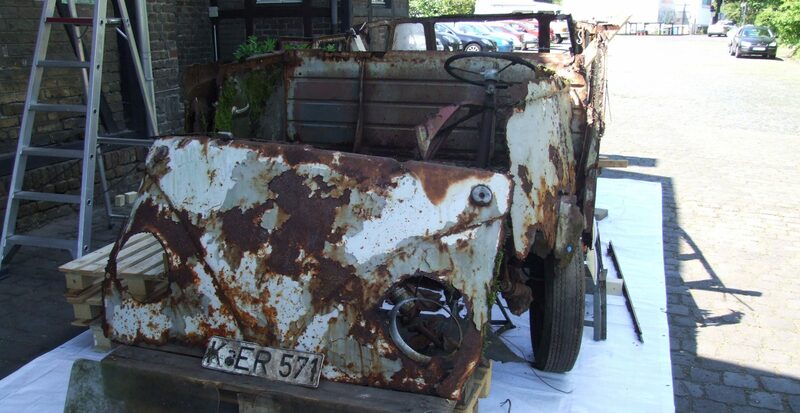 This will be the last possibility to see the Samba driving in this state and it will be the last chance to see the Samba before I bring it back to Mark Spicer who will continue the reconstruction of the body for the next years. If you can´t make it next Tuesday you can visit the Samba at the ARG Bonn (address: Godesberger Strasse 40, 53175 Bonn) until end of July. The dealership is open every day until 7.30 pm, Saturday until 2.00 pm. This is the current parking spot of the Samba: in the exhibition hall of the ARG in Bonn. Right beside the Samba you can check out a Brasilian Bay Window Bus “Last Edition”. This Bus was build at the very last day of the Bay Window production in December 2014. 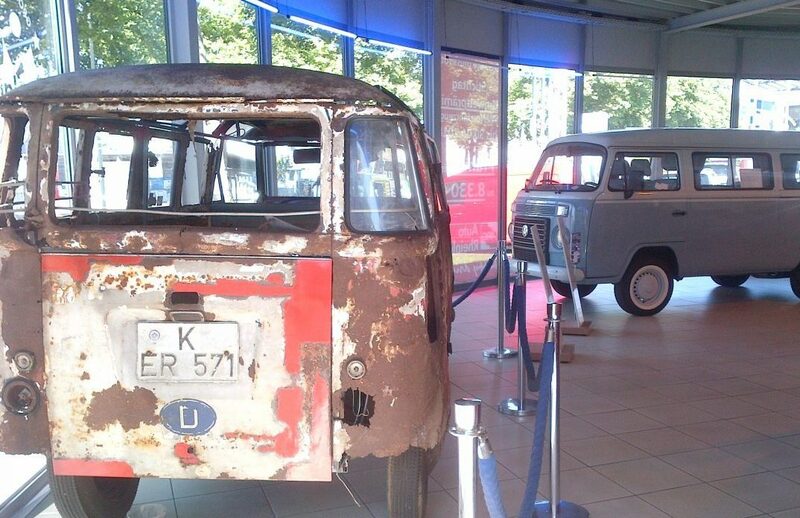 It´s a rare special edition and so the very first and the very last special edition VW kombi are standing right beside each other. Amazing, isn´t it? Contraire to the Samba, the “Last Edition” is for sale. And it´s still brand new! Details for the event on Tuesday you can check out at the Facebook side of the ARG. Come over, bring your vintage VW, be a witness of a historic moment and have some fun with other VW friends too! See the Facebook page of Auto Rheinland.